This bath recipe using mango and coconut fragrance oil from "From Nature With Love"
Mango fragrance oil : Exotic island mango freshly sliced and mouthwatering. Hints of sweet coconut and juicy kiwi complete this tropical fruity treat! Coconut Fragrance oil: An island favorite. Newly fallen coconuts halved to reveal creamy, sweet perfection! A pure coconut fragrance. Combines so well with tart fruits, chocolates, coffees, citruses and even some floral. Coconut is a staple FO to have around for sweetening blends. Add the mango and coconut fragrance oil to the dendritic salt , Blend well until the oil was absorb by the dendritic salt. Please use a large bowl to mix it. Add the Epsom salt to the bowl and stir well. Add liquid dye colour altogether and blend well until the color is green. 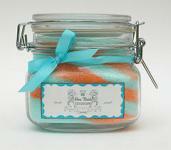 Your bath salts are done and ready for packaging.